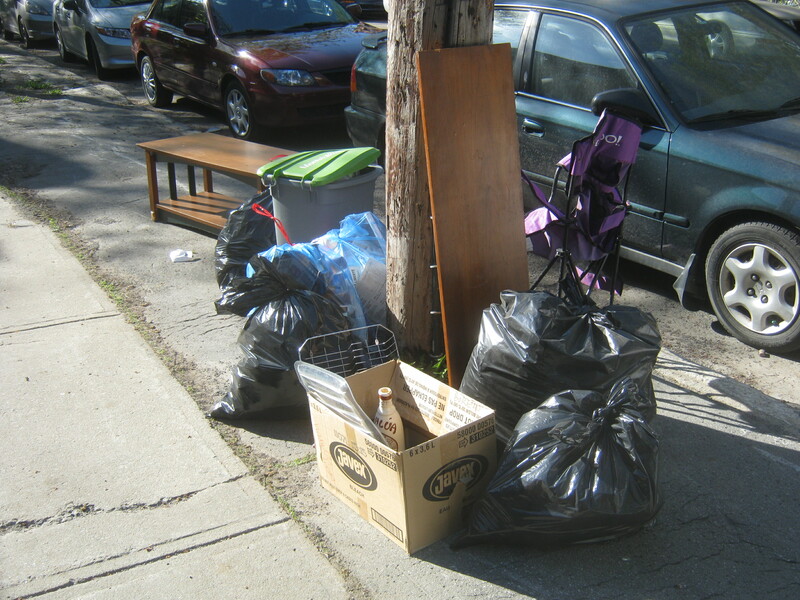 Monday morning is trash pickup in Rosemont. I got up at 7, made some eggs for breakfast and headed out to see what I could find. I came across this open box among the garbage in the picture above. Inside were a couple of old liquor bottles. The one on the left was made by OMB in celebration of the United States’ bicentennial. 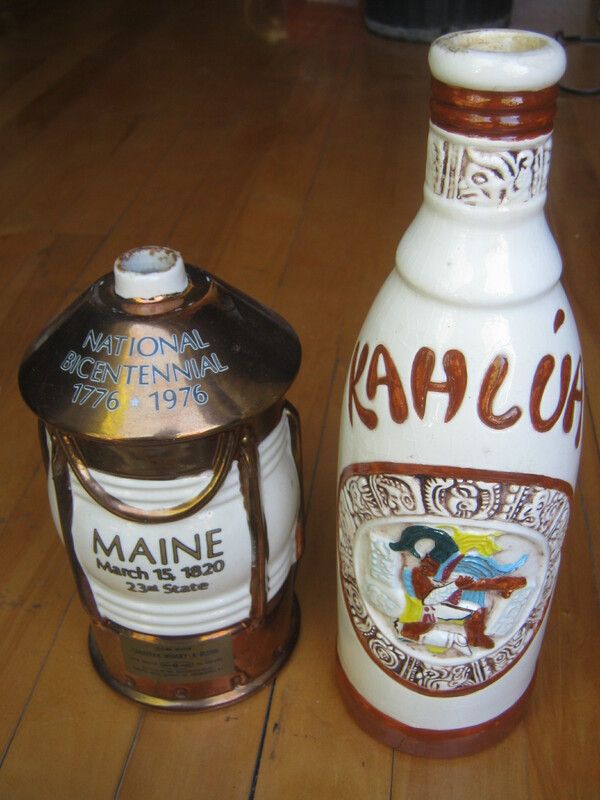 On the right is a hand-made Kahlua bottle. Here’s the label of the Kahlua bottle. It’s dated 1937, though that may be a copyright date. What do you think? Regardless it’s definitely a cool old bottle. 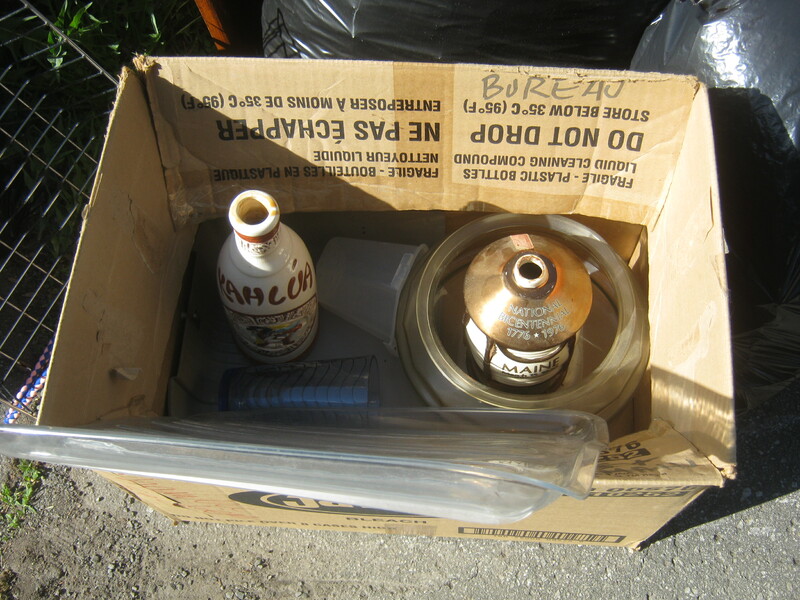 There was actually a bit of Kahlua left inside when I found it, which must mean that someone just finished it recently. I’m most pumped about what I found in this spot. 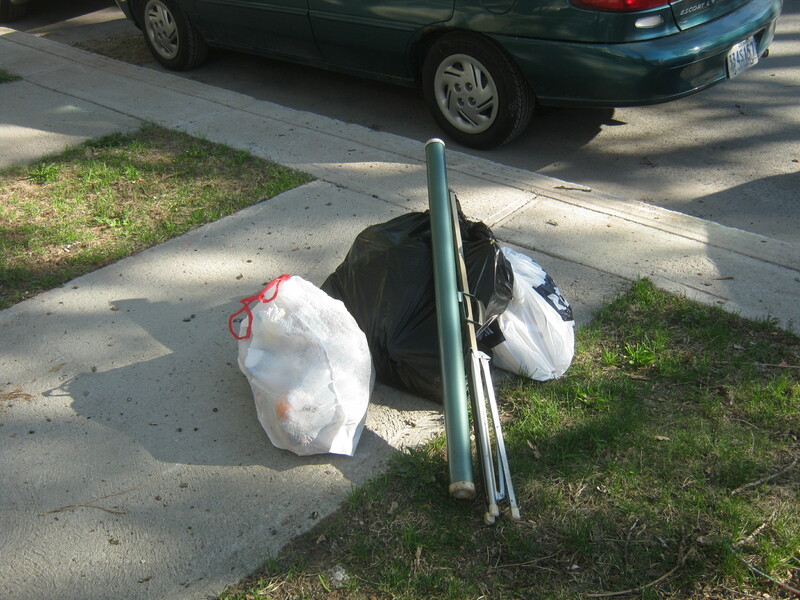 I stopped for the old projector screen (an Aurora Conqueror – funny name for a screen!) but also found some slides in the black bag. There were two boxes that contained full slide rolls. 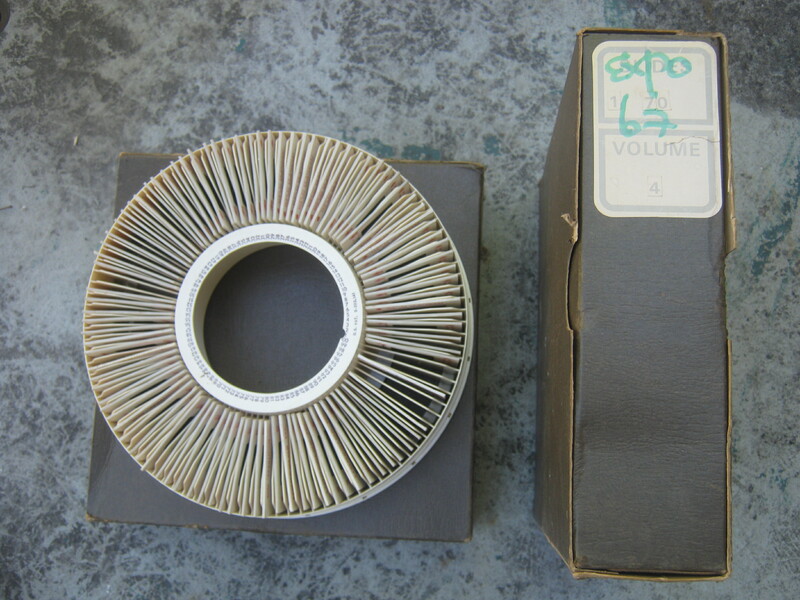 The boxes were marked “Expo 67” and the slides look like they were from that time. 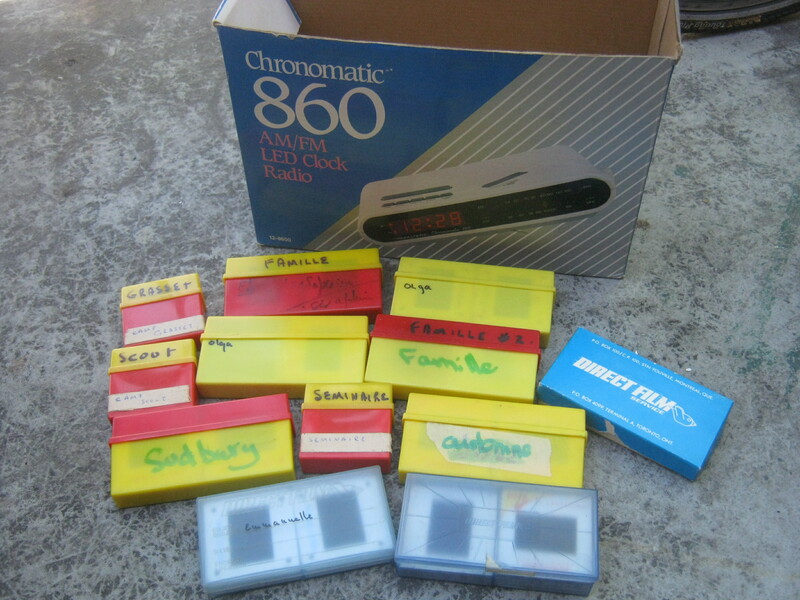 There was also an old alarm clock box that contained other slides. Most of them are dated from 1957-1970. There’s some family photos, baby photos, nature photos, old boy scout camp photos from the early 1960s, and an interesting looking set marked “Seminaire” (seminary). There’s also a box marked “Sudbury.” These are interesting because they look to be from before the Inco Superstack was built in 1972. This is a 380 metre high chimney – the tallest in Canada and the western hemisphere – which spread pollution from Sudbury’s nickel plants across a much larger territory. Before that the pollution was more localized, creating heavily acidic rain that killed off a lot of vegetation. Sudbury is a pretty rocky place and with the lack of vegetation certain areas apparently looked quite a bit like the moon. My stepdad, who grew up in Sudbury, was witness to that. These slides excite me because they seem to be very high quality, as if a photographer took them. It’s hard to say just from looking at the slide, but if they are indeed really nice photos they could have some historical value, and perhaps even make a good exhibit. This is especially true for the Expo 67 slides as the Expo was one of the biggest events in the history of Montreal. I think I can convert them to digital by using a light box and the macro setting on my camera. I’ll let you know how it goes! I definitely want to show them off. I’m going to check out the Mile-End area later today. I’ll let you know if I find anything! 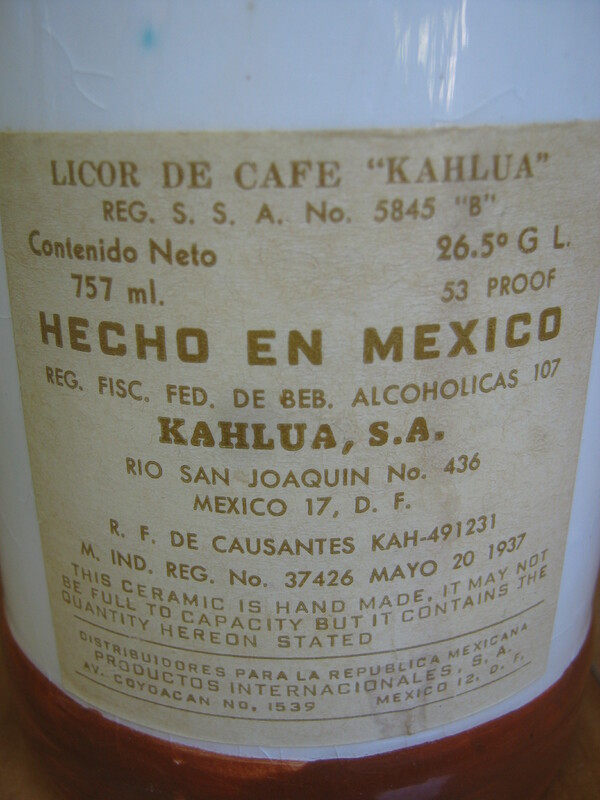 The 1937 date on the Kahlua bottle is the date of the Mexican law that regulate alcohol production. I’d guess the bottle is 1960s-1970s. Great bottle! Expo ’67, eh? I remember it well. The images should be interesting, and the Sudbury ones too. Old enough to be history.